Often it is thought that performance steadily improves, improving in a straight line from A to B. What actually happens is performance improves in Jumps from a platform of consistent performance. What if you could jump your performance to the next level and not only that, rather than plateau at that level like many, actually know what the next Jump in your performance will be, and the next, and the next and achieve the unreasonable? Would that be of value to you? From experience, not just theory, I have learned about what it takes to be successful at the very top of the world. This has enabled me to formulate tools and techniques that I have used on myself during the course of my career and I am now using with great effect to enhance others performance. You have to refuse to settle for mediocre or just an ok performance and have a burning desire to succeed. You have to jump at the unreasonable. People often think the unreasonably ambitious are crazy, maybe they're right but they are often the ones who achieve what people thought was unreachable. This is the true high performance mindset, and in high performance, mindset is everything. Success in my field is not my only learning curve, failure has served me just as well yet many people fear it. Fear of failure and worry are a waste of your time and will make you more likely to fail. Time and again I have had to pick myself up and dust myself off, come out swinging when my back has been against the wall. It is part and parcel of being unreasonably ambitious, successful and living on the edge of aiming to achieve greatness. It is imperative that you learn to roll with the punches and then hit back twice as hard. Resilience and a strong mindset are a must in this game as you never know what is going to be thrown at you and it is also part of the excitement of the beautiful challenge. I know firsthand that achieving success can be stressful, brutal and unforgiving. The pressure can feel like the weight of the world is pinning you down, that everyone in the world is eyeballing every centimetre that you move. I have been successful in front of millions of people and I have also struggled in front of millions of people. It is brilliant, enriching, rewarding and life changing once you know how to free yourself from the weight of the world, unravel your wings and fly to new heights you have only dared to dream of. Deciding to reach your unreasonable goals, investing in yourself and learning how to achieve your unreasonable goals, will be the best decision you have ever made and enable you to live the life that you truly deserve. 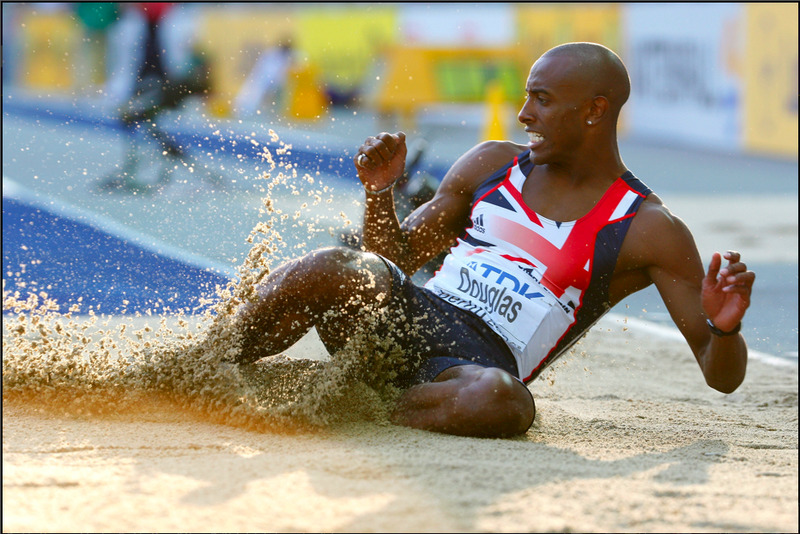 Nathan Douglas is one of the greatest triple jumpers Great Britain has ever seen. 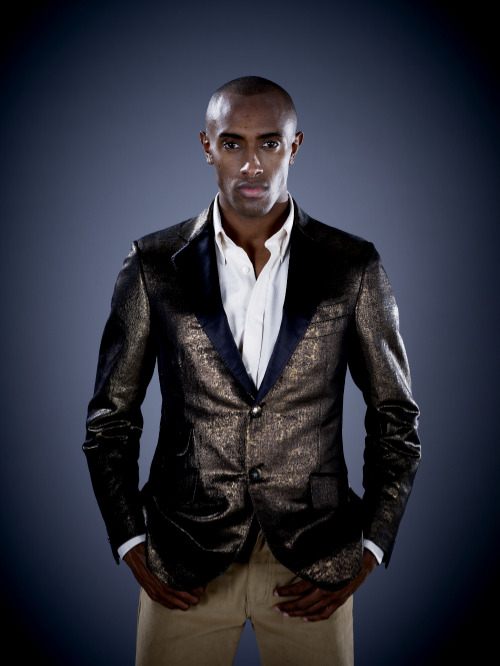 He is continually admired for the elegant style, graceful technique and spring with which he carries out the triple jump, and it is this which allowed him to develop as a world class athlete. At the tender age of 21, Nathan made a huge improvement on his lifetime best from 16.49m to 16.95m, performing when it mattered at the Olympic Trials, with his final jump in the 6th round. This resulted in qualification for his senior major championship debut for Team GB at the Athens Olympic Games, which was testimony to his outstanding talent at such a young age. While others around Nathan were nervous about him making his senior debut on the biggest sporting stage on the planet, with no experience, Nathan ceased the opportunity. In the qualifying rounds he jumped beyond expectations jumping his second longest jump ever of 16.84m and narrowly missed the final by a mere 7cm. Making a big impact the following season, Nathan competed at only his second senior outing, the European Indoor Championships, where he placed 4th only for a few centimetres to deny him a medal, showing the speed of his progression. He continued to put in the hard work after the indoor season and was rewarded on his first outdoor competition of the season, smashing through the magical 17m barrier, jumping a personal best of 17.11m. However, Nathan was not done there, in the first round at the AAA National Championships he wowed the crowd with a personal best of 17.34m. In the second round Nathan produced what truly put him amongst the worlds elite, he increased his personal best even further to a monstrous leap of 17.64m. This ranked him 3rd in the world and also 3rd on the all time British triple jumping list while making him the British Champion for a 2nd year in a row. This distance did not only show he was challenging with the best in the world, it also provided evidence that he was capable of performing exceptionally well under immense pressure. Taking confidence from the previous season, Nathan started the season brightly jumping 17.26m at the famous Prefontaine meet in Eugene, Oregon, USA, following up with a 17.42m in Geneva, Switzerland. What people didn't know was Nathan was now secretly batting chronic fatigue syndrome that came out of nowhere, suddenly he struggled to train, struggled to run, struggled to lift weights, struggled to sleep, struggled to compete and could only perform at 16 metres much to his frustration. At its worst even the most simplest activity like jogging, became difficult as his legs would burn like fire and felt as heavy as lead. Nathan, exhausted and battling these symptoms of M.E., impressively still managed to pull out a big enough jump to just scrape through to the final at the European Championships in Gothenburg. In the final Nathan’s team were understandably concerned as they could sense a first major championship medal opportunity slipping away, Nathan determinedly and unsurprisingly had other plans. Although tired and heavy legged Nathan’s faith in his ability to perform under pressure when it matters most paid off leaping to 17.21m, winning the silver medal and missing out on gold only to the Olympic Champion, however, defeating the Olympic silver medallist. After becoming the British Indoor Champion, up next was the European Indoor Championships in Birmingham, where there was an epic battle. A competitor laid down the gauntlet with a first round leap of 17.56m, the furthest jump in the world! Nathan unfazed and always ready for a battle relished the challenge and chased after him getting closer to the lead round after round, producing the series of his life, 17.08m, 17.21m, 17.47m, 17.41m. Smashing his indoor personal best, winning the European silver medal and ranking him 2nd in the world! As one sports journalist said "that was one of the greatest triple jump competitions I have ever witnessed and Nathan made it all possible by refusing to lose and giving it everything". Nathan reproduced this form in the outdoor season, but a serious hamstring injury cut short his season and he missed the World Championship in Osaka. Having worked hard to rehabilitate himself from this career-threatening setback, miraculously he still managed a return to form at the Olympic Trials and qualify for his second Olympic Games in Beijing. Nathan has always had a passion for performance psychology which lead him to achieve a BSc in Sport and Exercise Science (Psychology) from Loughborough University. He is a ICF ACSTH Certified Professional Coach and a Licensed Practitioner of Neuro-Linguistic Programming. Nathan is currently in training for the 2017 London World Athletics Championships. Over ten years spent living in the cauldron of world-class sport and an elite performance environment has given me the tools to empower clients to transform themselves, fulfil their potential, accomplish their wildest ambitions, lead from the front and create a high performance mindset. My mindset as a world class performer is to pull every last centimetre out of my potential, do everything within my power to perform at my best and leave no stone unturned. When competing at the top of the world everybody is talented, it is a very thin line that separates success and failure, therefore talent isn't enough. It is those that have the better mindset, mental focus, determination, preparation and work smart that constantly come out on top of their competitors. Time and again I have seen the most talented in the world fail to perform on the big occasion when it really matters. I apply this same approach/mindset to business and my clients, so that you deliver high performance behaviours that are fundamental to success. Through my passion for excellence, achievement and personal development; I challenge executives, support organisations, courageous entrepreneurs, ambitious business managers, young people overflowing with world class potential, people wanting to live their wildest dreams by achieving world class performance and creating permanent change, fast. I only work with the unreasonably ambitious, those that aspire to greatness and have big ambitions. Together we go on an adventure to change up the game and achieve that extra centimetre, as I understand the structure to success. Being unreasonably ambitious and setting unreasonable goals is what has transformed some of the worlds well known performers, think, Steve Jobs, Usain Bolt, Bill Gates, Richard Branson…..
Every person and business are unique, have different specific needs and bring different skill sets to the table. What works for one may be different for another. This is how I work, my work is completely centred around you, your needs, together we form a team and focus on improving your performance. I work with clients mainly through video calling and face-to-face, giving you flexibility. Clients love the fact that they or I can be anywhere in the world and we can still work seamlessly together on their performance. Would it be of value to you to perform at a world class level? Would performing at a world class level help you achieve your ambitions faster? Would achieving your ambitions faster help you achieve more? Could you do with getting the people working for you engaged, fulfilled, valued, working at their best and consistently performing at their peak? Are you stuck and unsure where to go and what to do? Achieving world class performance is more than what you do on the day/in the moment/on the occasion, it is also what you do outside of these times; at home, your relationships, your habits, your leisure time, all areas of your life have a vital impact on your performance and need to be in order to create balance and create the ideal optimum performance environment to enable you to flourish. I believe that anything is possible and everyone has it inside them to be great. My mission is to help as many people as possible to create a Jump in their performance by helping them smash through their limitations, release their inner passion, take control of their destiny, see their true vision, unlock their true potential and become world class. How come some thrive under pressure while others crumble? Sign up with your email address to receive Reflections and feel good about sharing with others to help improve their performance too. We respect our privacy and we respect yours too. I have asked my clients to share their experience of working with me, so that you get a true sense of what I do and the results I bring. “I have been working with Nathan for 8 months now, I have nothing but praise for the help he has given me to develop my business and importantly improve my work / life balance. Working together we have used traditionally coaching techniques and importantly Nathan’s guidance is greatly enhanced from his own experiences as an athlete. This was supposed to be a short term arrangement however with the amount of success I have had from Nathans coaching I plan to continue for some time. “I approached Nathan at the start of 2015, expecting him to coach me from a sports performance aspect. From day one he surpassed my expectations as he wanted to know what my ‘vision’ was. I told him I wanted to go into sports marketing and management but I knew nothing about it he then asked ‘what can you do to find out?’. After the first session we hardly touched upon becoming a world class athlete. Instead we turned our focus to how am I going to close the experience gap that I lacked in sports marketing and management so that I can secure a prestigious internship. What Nathan guided me to do was to put myself out there. However, I didn’t expect anything to come from it, I assumed me e-mailing these big companies/people would be hopeless. Within a day the agent of Usain Bolt and Mo Farah replied to me advising me on how to gain experience, I couldn’t believe it! Slowly I began to learn that if you don’t ask you simply won’t get and as Nathan taught me, the worst that can happen is they say no or they don’t reply. After a few sessions Nathan taught me how to be my best self, which I now use daily. In July 2015 I secured a work placement at GLL Sports Foundation (the largest independent athlete support programme in the UK), gaining invaluable experience and connections. I came to Nathan expecting him to teach me what I needed to be successful, when in actual fact he showed me that I had what I needed to be successful; I just needed to trust and believe that what I had was more than enough.